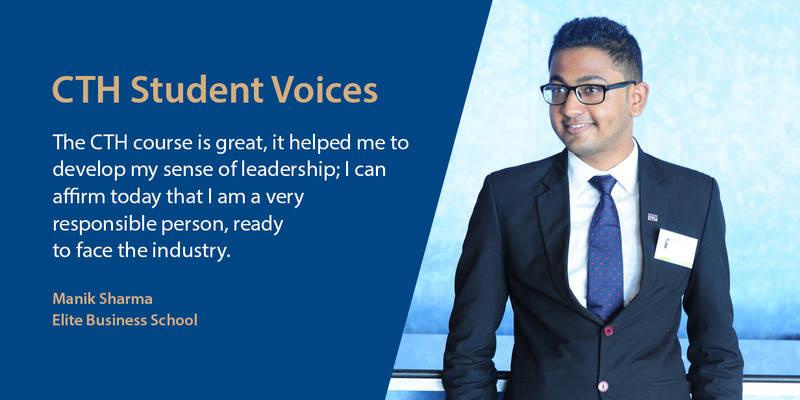 I, Manik Sharma from India started my journey when I joined Elite Business School (Mauritius) to pursue the CTH course to have an international exposure as far as hospitality and tourism is concerned. Elite Business School has a very friendly atmosphere where I have been guided by positive criticism to achieve the best in my studies. The staff and the lecturers developed and equipped me with skills to help me personally and in my professional career. How to manage and value my time is what I have learnt from Elite and CTH and this is vital for the hospitality industry. The practical and the industry exposure organised were fabulous and proved to be inspiring. My experience at Elite is very satisfactory especially the graduation ceremony which was organised by Elite Business School for the first time in Mauritius. It was such a proud moment for each student who was awarded the certificate on that day. Elite Business School helped me to manage and value my time. For me personally, CTH is a great course which helped me to develop my sense of leadership where I can affirm today that I am a very responsible person ready to face the industry. It's not difficult to secure a job after CTH course as it is recognised worldwide. I am proud to be a CTH student in Elite Business School.